Indicator – This denotes the level of packaging for a particular carton. This one-digit prefix can range from 0 to 8. GS1 Company Prefix – Vendors must obtain a GS1 Company Prefix directly from GS1 to uniquely identify their company. Depending on the number of items a company needs to identify, a GS1 Company Prefix may be 7 to 10 digits in length. Item Reference– References the same product number used for the item level GTIN (GTIN-8, GTIN-12, GTIN-13) when a carton is made up of the same item. For cartons that contain an assortment of items a new product number is assigned. Check Digit – The last digit of GTIN-14 is a calculated check digit. Using a MOD10 check digit algorithm, the calculated check digit prevents substitution errors. An online check digit calculator is available at https://www.barcode.graphics/check-digit-calculator/. 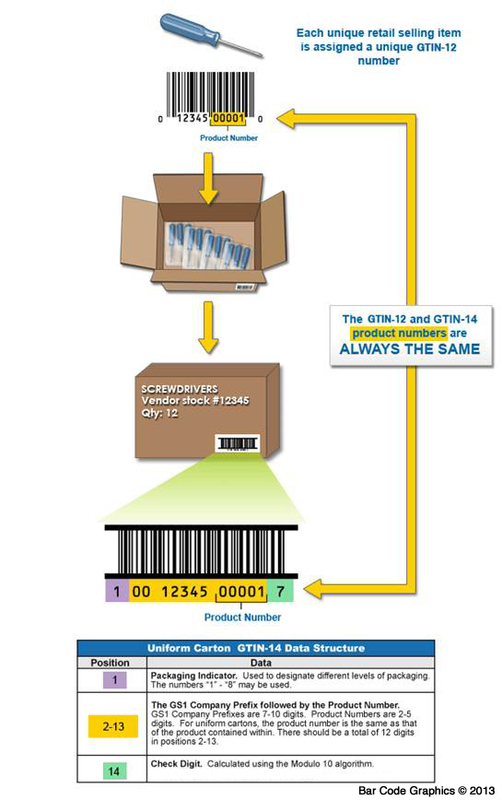 The ITF-14 barcode is the most common data carrier used for the GTIN-14 data structure in retail organizations. ITF-14 is a 14 digit bar code that uses the “Interleaved 2 of 5” symbology (I2of5, or ITF). The GTIN-14 data can also be conveyed in other GS1 barcode data carriers, such as a GS1-128 barcode. ITF-14 barcode symbols include bearer bars, which are surrounding bars which protect the barcode image. If the ITF-14 is printed directly on a corrugated carton it must be surrounded by bearer bars. 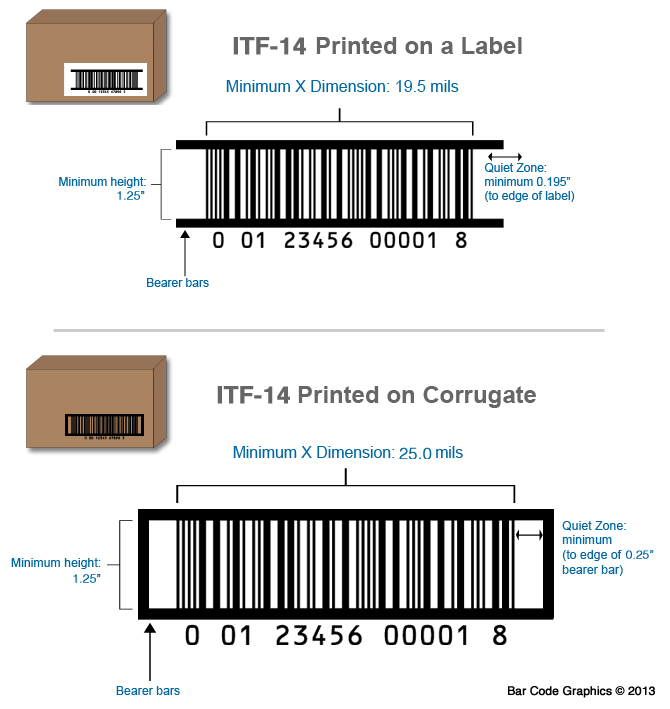 For ITF-14 bar code symbols printed on a label, only horizontal bearer bars along the top and bottom are necessary. The following illustration displays example images and the minimum sizing for each scenario.